Grocery store bouquets are notoriously boring and tend to read last minute. But with a little creativity an inexpensive grouping of mums, baby's breath and even carnations can look chic and modern. 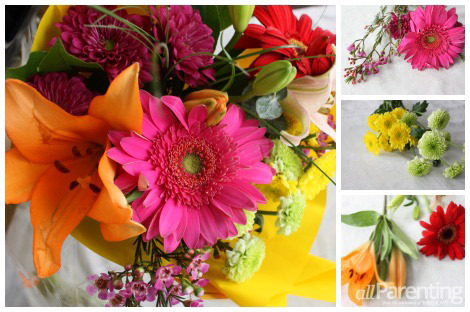 Learn how to transform a store bought bunch of ordinary flowers into a one-of-a-kind display. We've all been there — staring down the floral section at the grocery store with nothing more than a tired selection of mums, baby's breath and carnations — desperate for a last-minute hostess gift or table decoration. At its best, the scene is uninspired. At its worst, soul crushing. Not to fear, with a little vision, a pair of scissors and a few interesting vessels you can take plain, old market flowers to a truly artful level. First things first, think about your vase. 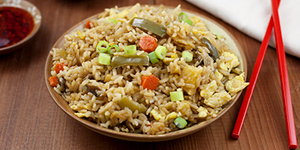 Do you have something at home you are planning to fill? Consider filling a collection of canning jars, empty glass milk jug or even empty baby food jars. Yes, you read that right. Read on fearless florist. You can do this. Once you've decided on your vessel (or vessels for today's example) take stock on the flower selection. Can you put together a monochromatic look by combining several small bouquets? Grocery store flowers often look boring and generic because of their old-fashioned groupings and mixed color arrangements. A handful of mums, mixed with a bit of fern, baby's breath and maybe the odd sunflower or carnation. These scream hospital gift and I don't want them anywhere near my dining table. The only thing missing is a mini Mylar balloon or stuffed bear. I recommend splurging on one big bouquet when you know you're going to divide up the flowers based on color or pick up two smaller and less expensive bouquets in the same color range. Fill your vessels with fresh, cool water. I'm using three small canning jars for my centerpiece and I've set aside several additional vases for the oddball flowers. We're talking about the lone lily or Gerber daisy that just won't work with the main stage arrangement. Unwrap your bouquet, working quickly to minimize the flowers' time out of water. Group flowers by color. For example: divide up all the pinks, whites, purples and greens. Set your oddballs aside. Pick a color and get to work by holding all the flower heads at the same level, then snip all the ends, leaving a couple extra inches to work with. Place them roughly in your vase. Repeat with remaining vases by color. At this point, you will start to see the monochromatic theme coming together. Decide how tall you want your finished product to be. I prefer short and compact bouquets, especially when I'm working with a cluster of vases. Pull out a bouquet and hold it tightly, close to the head of the flowers. 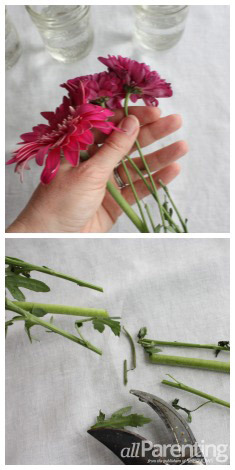 Consider wrapping the bouquet with a rubber band if needed and trim until you achieve your desired height. You can play with the rubber band placement and start to fan out the flower heads and rearrange depending on your preference. 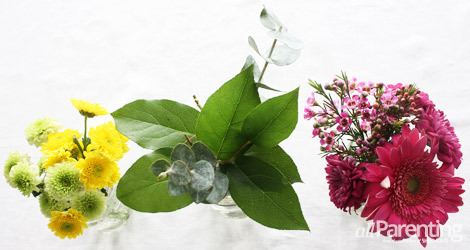 Continue to trim your ends until the entire bouquet rests in water with only flower petals visible above the vase. Repeat steps 4-6 with the remaining bouquets. For my arrangement I grouped two vases with color and one with simple greenery. In your market bouquet the greens are the filler, but I think they stand beautifully on their own. Do you have an herb garden? This is a great opportunity to add some fragrant greenery since most commercially-grown flowers have little to no scent. A few sprigs of mint, rosemary or sage will make your bouquets truly unique and no one would guess they came from the market — even if you bought the herbs there, too! I love adding a bit of ribbon to my arrangements. The jar full of greens needed just a hint of drama and I think the simple black ribbon tied in a knot adds just that. The three Mason jars look great lined up at the center of the table and we've still got flowers and filler to spare. This is when the rest of your house benefits from your creativity. Showcase a single stem with a bit of green and place one in the bathroom, another on your bedside table and still one more for the mantel. Single stems with large blossoms like Gerber daisies, lilies and carnations can look sweet and sophisticated when they stand alone in a unique vase. I like to keep a glass milk jug, baby food containers and vintage mint julep cups on hand for just this reason. For less than $10 you've brought color and style to four rooms in your home. Next time you find flowers on your grocery list, spend a few extra minutes thinking about the end results and let your creative side take over.